"Come a Little Bit Closer"
(1963) "Come a Little Bit Closer"
(1964) "Let's Lock the Door (And Throw Away the Key)"
"A Song in the Night"
(1977) "Come a Little Bit Closer"
(1977) "She Can Put Her Shoes Under My Bed (Anytime)"
"Come a Little Bit Closer" is a song by the 1960s rock and roll band Jay and the Americans. It reached number 3 on the Billboard Hot 100 in 1964, making it the band's highest charting single. It remains their most popular song, according to Last.fm song rankings. It also peaked at number 4 on the Cashbox chart and at number 1 on RPM's singles chart. The single served as a comeback for the group, who had not had a hit in some time. It was written by songwriters Tommy Boyce and Bobby Hart, as well as Wes Farrell, and became Boyce and Hart's first top 10 hit. 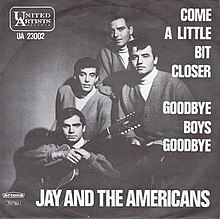 Jay and the Americans also recorded a Spanish version of the song, in which, due to a poor translation, the final punch line is missing. The song is featured in the 2017 film Guardians of the Galaxy Vol. 2. The lyrics tell the story of a young woman who is romantically involved with a man named José, but seduces the narrator with flattering words until he is love-stricken. After they kiss José arrives and the narrator flees, only to hear in the distance as the young woman uses on José the exact same enticing words she told the narrator, suggesting she lures every suitor she meets with the exact same "script". ^ AllMusic.com Retrieved February 4, 2012. ^ Last.fm Retrieved February 4, 2012. ^ SongFacts.com Retrieved February 4, 2012. "Let's Lock the Door (And Throw Away the Key)"
"It's a Big Wide Wonderful World"
"It Couldn't Have Been Any Better"
"She Can Put Her Shoes Under My Bed (Anytime)"
"Please Help Me I'm Falling (In Love with You)"
"I'll Love Away Your Troubles for Awhile"
"Down to My Last Broken Heart"
"I'll Need Someone to Hold Me (When I Cry)"
"Don't Worry 'bout Me Baby"
"It Ain't Easy Bein' Easy"
"He's a Heartache (Looking for a Place to Happen)"
"Let's Stop Talkin' About It"
"If the Fall Don't Get You"
"Your Heart's Not in It"
"The First Word in Memory Is Me"
This page was last edited on 18 December 2018, at 15:31 (UTC).